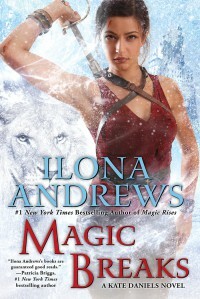 It goes without saying that Ilona Andrews are one of my favourite authors ever, and their Kate Daniels series is one of the best UF series around. I am going to try to avoid huge spoilers because it would really spoil the story for the reader if I go into detail. Magic Breaks is a book that heralds the ending of a huge arc that spanned the last seven books that builds up to a huge confrontation that Kate has to face–her big, bad father who has been a looming shadow throughout the series. I also found that the pacing was very tight and tension filled, and I was left in tenterhooks because the action doesn't let up until the culmination of the huge climactic ending that literally reflects the title of the book which is beyond fitting. I also loved the changes between the characters, especially with Kate and Curran, whose chemistry is a pure delight to watch from how much they’ve grown as a couple. I loved how committed and supportive they were with each other when they were facing huge uncertainty and danger. The confrontation was well worth the wait with a few twists that I really loved because it showed how much growth and development that Kate went through in the past seven books. The other characters also illustrated similar development and changes and the outcome at the end of this book is going to bring out some delicious elements in the series, and I am eagerly awaiting to see how this pans out. Ilona and Gordon have unleashed new changes and a wonderful nuance to the characters and new ongoing story arc which keeps this series fresh and engaging. I think it will be fabulous to see how Kate and co will deal with a world things have been turned on its head. This is one of the few series that seriously gives me the giddies and entranced with great cast of characters and heart-pounding and fast pace action sequences.